The Gatwick vs. Heathrow debate began in September 2012 when the Airports Commission was established by the Department of Transport, with a mandate to set out how the United Kingdom could: “maintain its status as an international hub for aviation” as it was losing routes to other European hubs. Nearly 3 years later in July 2015 the Airports Commission, chaired by Sir Howard Davies, former chairman of the Financial Services Authority, published their report recommending that a third runway at Heathrow was the best way to expand the UK’s airport capacity. However many disagreed with these findings and the Gatwick vs. Heathrow debate has intensified whilst we’re waiting for the Government to make its final decision. Both airports have been strengthening their individual cases to win the backing of the government, and many thought leaders have been weighing in on the debate including politicians, journalists, and environmental campaigners. Gatwick released their own report entitled “Response to Airports Commission Consultation” stating more work was needed to produce a thorough, balanced, fair, sound and robust assessment. A few key areas lacking in the Airport Commision’s report highlighted by Gatwick were: Traffic Forecasts where Gatwick’s traffic was understated, and capacity and traffic at Heathrow overstated; Economic Assessments, where inherent errors in traffic modelling, capacity assessment and the impact of competition were apparent; Cost and Financing, where a more in-depth assessment of the comparative costs, financial proposals and risks needs to be undertaken; and Air Quality and Noise, where the challenges facing Heathrow have been understated, and where greater transparency is needed to understand the impacts more clearly. A condition of Heathrow expansion is “acceptable” air quality, but the air around Heathrow already breaches EU limits. Heathrow’s expansion would break European air quality rules, delaying the construction of an extra runway and harming the environment. Heathrow argue that only they can connect the UK to long-haul growth markets and make more routes financially viable for airlines, as Heathrow is where that demand is strongest. They also say they are the best placed to deliver jobs, more exports and business as 120 of the UK’s top 300 company HQs are within a 15 mile radius of Heathrow. We were very interested in seeing which professionals and brands were leading the online discussion, so we analysed over 50K tweets matching the following query: “airport expansion” OR airportexpansion OR ((gatwick OR heathrow OR #lgw) AND (Expansion OR Runway OR Aviation OR Noise OR “Air Pollution” OR “Howard Davies” OR “Night flights” OR “Zac Goldsmith” OR Connectivity OR Hub OR “Air Quality”)) OR gatwickexpansion OR heathrowexpansion OR “Airport Commission” OR “Boris Island” and identified the top 100 most influential brands and individuals leading the discussion on Twitter. We discovered a very engaged community, with much discussion between individuals and brands, joining together in conversations. Below you can see a network map of the online conversation created with our Influencer Relationship Management software IRM. 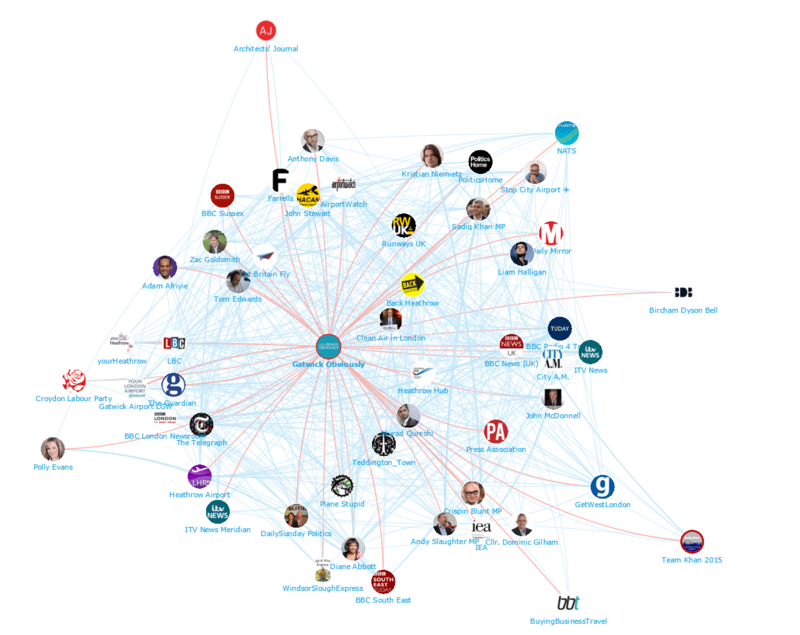 This map shows the brand Gatwick Obviously at the centre, and the conversations to and from all the influencers in that field. Below you can see another network map created in IRM showing the brand Clean Air London at the centre, and the conversations to and from the different influencers. As you can see it is a very engaged community with many conversations. If you are interested in learning more about identifying, managing and engaging with influencers click here to get in touch! 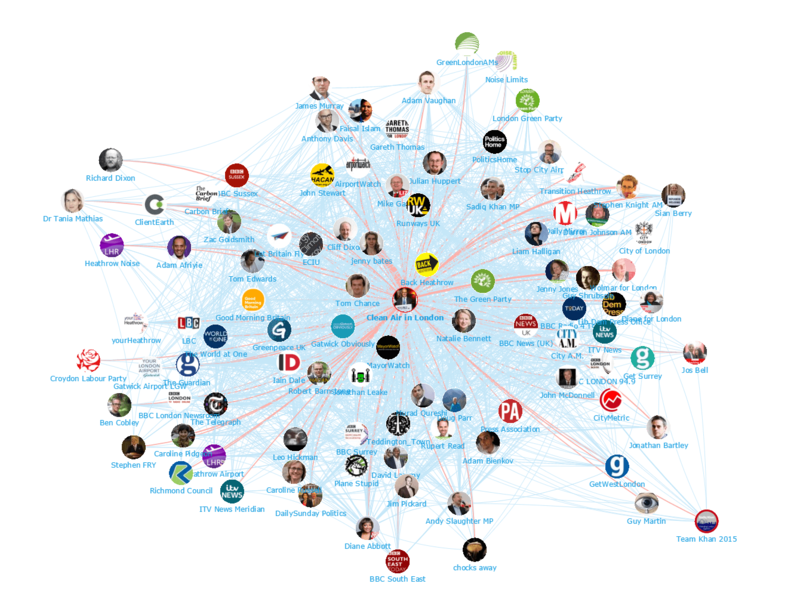 We looked at all the individuals engaging on Twitter to bring you a list of the top 100 most influential individuals in the Gatwick vs. Heathrow debate. Be sure to hit the download button below to grab the full report and see who ranks beyond the top 50. With all the discussion and resources available online, our analysis produced a great set of independent information resources and communities. Influential brands such as The Today Programme, The Telegraph and BBC News are leading the debate. Disclaimer: As ever with these lists, it must be stressed that the ranking is by no means a definitive measurement of influence, as there is no such thing. 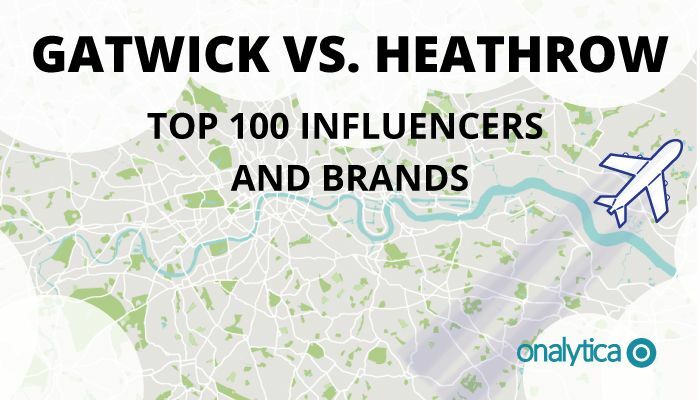 The brands and individuals listed are undoubtedly influential when it comes to driving discussion in the Gatwick vs Heathrow debate. The PageRank based methodology we use to extract influencers on a particular topic takes into account the number and quality of contextual references that a user receives. These calculations are independent of a user’s number of followers, but we do filter our lists based on how much a user is engaged in the conversation and the influence they drive through their networks.